White House Chief of Staff John F. Kelly announced Friday that beginning next week, the White House will no longer allow some employees with interim security clearances access to top-­secret information — a move that could threaten the standing of Jared Kushner, President Trump’s son-in-law. Kushner, a senior adviser to the president, has been able to see some of the nation’s most sensitive secrets even as his background investigation has dragged on for more than a year. White House officials have privately discussed concerns that Kushner’s clearance faces obstacles, according to people familiar with internal conversations, who spoke on the condition of anonymity to describe private talks. Among the potential problems: repeated amendments that he had to make to a form detailing his contacts with foreign officials. 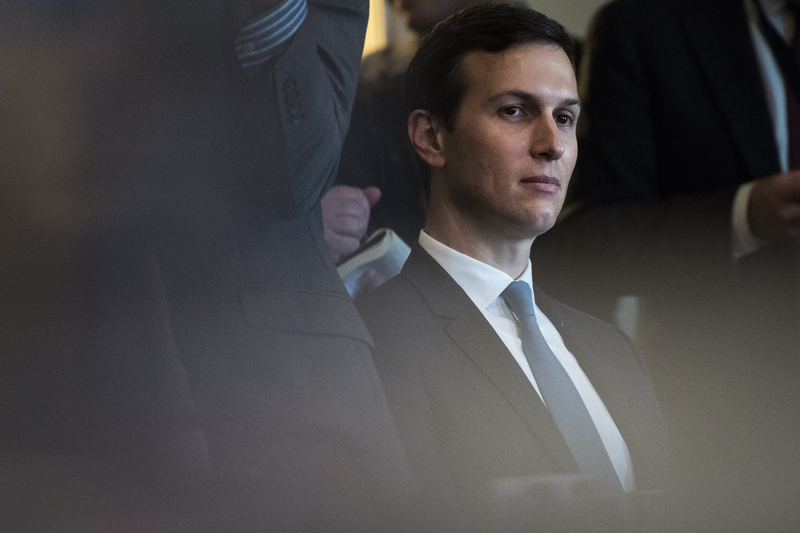 Two U.S. officials said they do not expect Kushner to receive a permanent security clearance in the near future, The Washington Post reported last week. In the meantime, Kushner has maintained an interim clearance that gives him access to top-secret and sensitive compartmented information — a rare level of access to hold for a long period of time, experts said. His elite position has allowed him to meet with foreign officials around the world and read the classified intelligence prepared daily for the president. A senior administration official with knowledge of Kelly’s thinking said that the chief of staff has been frustrated with Kushner’s high level of access without a final clearance and that he was aware the new policies announced Friday could jeopardize Kushner’s ability to carry out his duties in the West Wing. The move puts a “bull’s eye” on Kushner, the official said. Abbe Lowell, an attorney for Kushner, said Kelly’s directive “will not affect Mr. Kushner’s ability to continue to do the very important work he has been assigned by the president.” White House officials declined to comment on how the new policies would specifically affect Kushner. Kushner’s ability to maintain his current portfolio, which includes classified briefings, could change next week. That’s when Kelly said he plans to discontinue high levels of access for White House employees whose security clearances have been pending since June 1 or longer, according to a memo obtained by The Post. As part of the security clearance overhaul, Kelly said the White House has reviewed the status of outstanding background investigations with the FBI and encouraged their timely completion. And he laid out new policies to streamline the clearance process and better involve the White House Counsel’s Office. The changes were prompted by intense scrutiny that has followed domestic-abuse allegations against Rob Porter, the president’s former staff secretary, who was also working under an interim top-secret clearance. Dozens of other White House personnel also work under interim clearances, although not all of them are at the top-secret level. Kushner has been present at meetings with the president where classified information was discussed and has access to the President’s Daily Brief, a digest of intelligence updates based on information from spies, satellites, and surveillance technology, according to people with knowledge of his access. Experts said it is rare to have such a high level of interim security clearance for such a long period of time. It is particularly striking access for someone like Kushner, who has never served in government and has a complex history of financial transactions, business ownership and contacts and dealings with foreigners. Most interim clearances are granted by the Defense Department, where they expire after 12 months, said Evan Lesser, president and founder of ClearanceJobs.com, which helps place cleared employees in government positions. Typically, other agencies follow that policy. “It’s very unusual” to have an interim clearance for longer than one year, Lesser said. Kushner’s background investigation appears to have been prolonged after he filed three updates last year to a questionnaire that requires full disclosure of contacts with foreign officials reaching back several years. Investigators scrutinize those activities to determine whether a person could be subject to influence or blackmail by a foreign government and to judge whether the person can be trusted to guard classified information. Ordinarily, experts said, the failure to completely disclose all contacts would jeopardize an applicant’s chances of obtaining final clearance. Lowell, Kushner’s attorney, said Kushner had disclosed more information on his security forms than was required out of an abundance of caution. Inside the White House, officials — including White House Counsel Donald McGahn — have privately discussed during the past six months the slow pace of Kushner’s background investigation, noting his amended disclosure as a possible factor. In the fall, McGahn discussed the fact that Kushner was working on an interim clearance with Kelly and again raised the issue of his earlier incomplete disclosures, according to a senior administration official. McGahn and Kelly decided to wait for the FBI to complete its background investigation and took no action. Kushner’s pending security clearance comes as his actions and business dealings have come under scrutiny from special counsel Robert S. Mueller III, who is probing Russia’s meddling in the 2016 election. In interviews with witnesses, Mueller’s investigators have asked about Kushner’s contacts with foreign officials, according to a person familiar with the sessions. Kushner is only the most notable White House staffer working without a final clearance. The White House appears to have issued more interim clearances than previous administrations, probably because of the larger number of people who have never been civil servants and gone through the clearance process, or who came to their jobs with complicated business and financial histories, according to Lesser. “We’re in uncharted territory here for a lot of people in the White House,” he said. The White House Security Office is tasked with making a final assessment of the findings of an FBI background investigation. But the White House’s adjudication guidelines are different from those of other government agencies and departments and give wide latitude for awarding clearances. Ultimately, the president can give clearance to anyone he wants. Devlin Barrett, Ellen Nakashima and Philip Rucker contributed to this report.